October | 2011 | Small Farmers. Big Change. As an independent and integral voice in the Fair Trade movement, United Students for Fair Trade has held many meetings to conclude on where we stand on Transfair/Fair Trade USA’s recent decision to leave FLO. We are deeply concerned by FT USA’s move to leave FLO and many other decisions made preceding it. We have analyzed the potential consequences of the new changes and have decided that the moves FT USA is making will be detrimental to the progress the movement has achieved for producers and artisans all over the world.These lowered standards undermine the Fair Trade values producers, activists, and consumers have advocated for since the inception of the Fair Trade movement in the late nineties. Since this time, public outcry from community stakeholders to uphold the integrity of the standards have repeatedly fallen on deaf ears at Transfair/Fair Trade USA. We have therefore concluded that until these community stakeholders – small scale farmers, producers, workers, community and student activists, and 100% Fair Trade businesses – can reconvene to assess these changes, we can no longer in good conscience promote Transfair/Fair Trade USA products. We hereby pull our support from Transfair/Fair Trade USA and encourage others in the movement to do the same until drastic reforms can be made. We fear that without such action from Fair Trade supporters, Fair Trade will entropy into a little more than a cheap marketing ploy. Increasing fair-label washing which will cause more consumer distrust and confusion and cripple the power of the movement to make real changes in farmers’ lives. Fair Trade standards should not be tailored to business or corporations. Corporations should tailor their businesses to meet the needs of farmers! If these entities would like to associate themselves with having ethical products, they should have to make the same commitment to these values and the producers who deserve it that those smaller businesses before them have successfully made. Why would we sell out on Fair Trade values at the point of entry to this market – the very moment when our movement’s bargaining power against corporations is at its peak? We believe that Transfair/Fair Trade USA’s willingness to bend standards is the consequence of a conflict of interest in their funding structure and a lack of accountability on their board. It seems obvious to us that their desire to take on more lucrative certification contracts, more so than any purported issues with supply, are motivating the alarming deviations from the founding-principles of Fair Trade, such as the inclusion of plantation-grown commodities, lower multi-ingredient standards, and their launch into commodities like apparel and bananas that activists have asked them not to pursue without more cautious forethought. 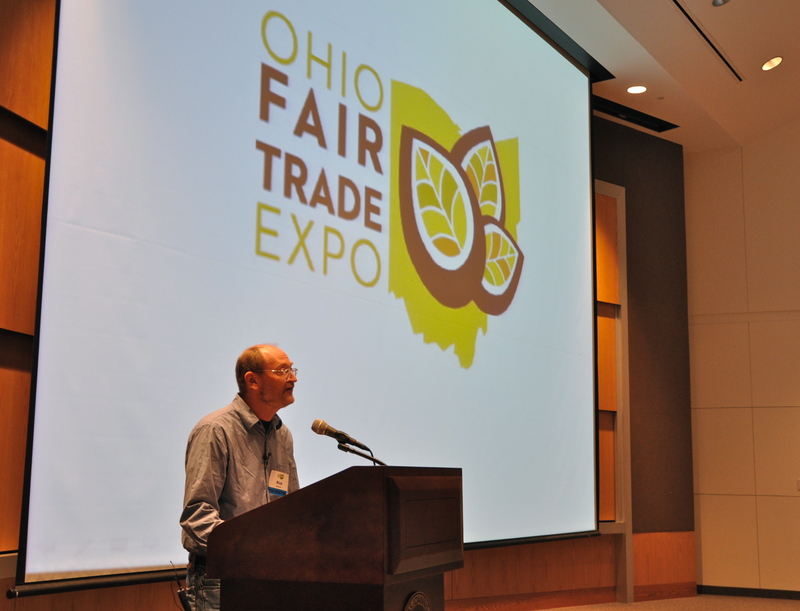 This is the third and final part of Rink Dickinson’s speech on the state of fair trade, delivered at the IRTF conference in Cleveland, Ohio on October 23rd. The Trojan horse for plantations was tea. After the initial success of the Max Havelaar fair trade certification scheme in Holland the fair trade certification idea spread. Soon there was a Max Havelaar Belgium and Switzerland. An allied but competitive seal started in Germany called Transfair Germany. Soon there was a Transfair Austria and Luxembourg. These two organizations did not like each other and fought for marketing turf and liscensing revenues/sales dollars. Transfair Germany and therefore all the Transfairs brought in plantations in tea with the idea that if you couldn’t find small farmers, just substitute in a plantation, make a few changes and voila fair trade tea would exist. The reality is the Germans did not understand how fair trade functioned. Remember the key economic and social engine of fair trade is access. The Dutch vociferously objected to plantation tea even being considered fair trade. After several years of fighting over this and a host of other issues the two organizations were forced to merge creating Fair Trade Labeling Organization. In that merger tea plantations and hence plantations were accepted as part of fair trade. 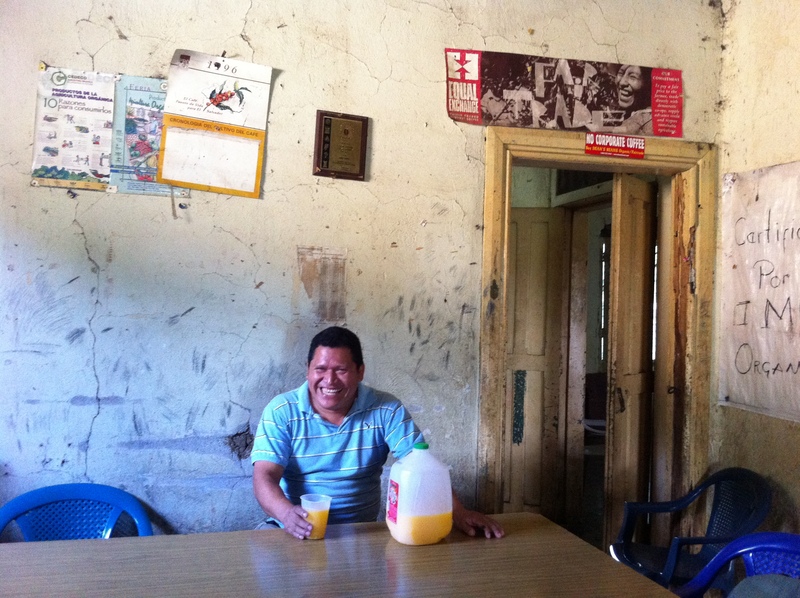 Part II: Building Fair Trade Coffee: How and Why? It’s not like just one day Starbucks or Green Mountain or Dunkin Donuts woke up and decided it would be a really hip idea to buy from small farmers coops. No; it took years and decades of work to organize, entice and cajole these worthy giant corporations to do it our way. And let’s be clear; we did not ask them for their advice on how to trade fairly, how to support small farmers and how to have fair trade “impact”. Remember that word impact because it is being bandied about quite a lot by the people who are trying to steal fair trade from us. Their argument is whatever leads to higher volume by definition is higher fair trade impact. No, Starbucks and Green Mountain and Dunkin Donuts had very high volumes of coffee but no fair trade impact until we allowed them into our system on our rules. And to be clear large corporations are welcome to participate in, and profit from and support authentic fair trade. But they or their unconscious surrogates such as Transfair USA are not welcome to take over our fair trade. They can have all the corporate responsibility programs they desire. That is great. But no they do not get our beautiful model that activists, consumers, small farmers and alternative trade organizations have patiently built for decades. Fair trade is ours not theirs. The coffee supply chain was built by alternative trade organizations such as GEPA in Germany, Fair Trade Organizatie and Stichting Ideele in Holland, and Twin Trading in the UK. These organizations and their NGO allies went out and made connections with small scale farmers. Usually those farmers were selling to middle level traders who were exploiting them. The farmers all were in some process of forming or strengthening democratically controlled coops that would keep the surplus made in the coffee trade with the farmers. These organizations and their NGO allies then had to slowly build the coops’ capacity. 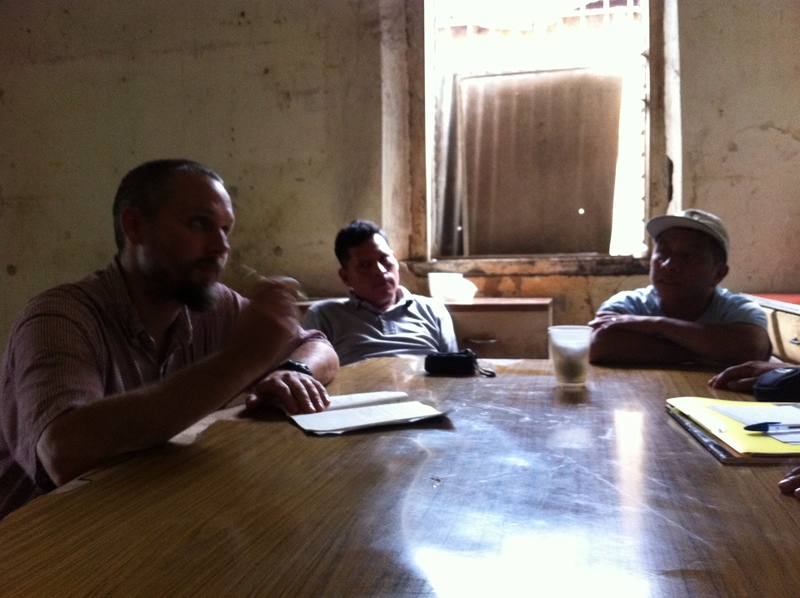 The coops had to learn how to wet and dry process their coffee. Without controlling the flow of coffee into the processors and the internal terms of trade small farmers would remain exploited. The alternative trade organizations and the coops then had to learn how to export and import. How do you get the legal right to do that? How do you send money in a way that it actually gets to the coop? Speaking of money, how would all this coffee get financed? Fair trade lenders were built from this network to solve this part of the problem. What about quality? 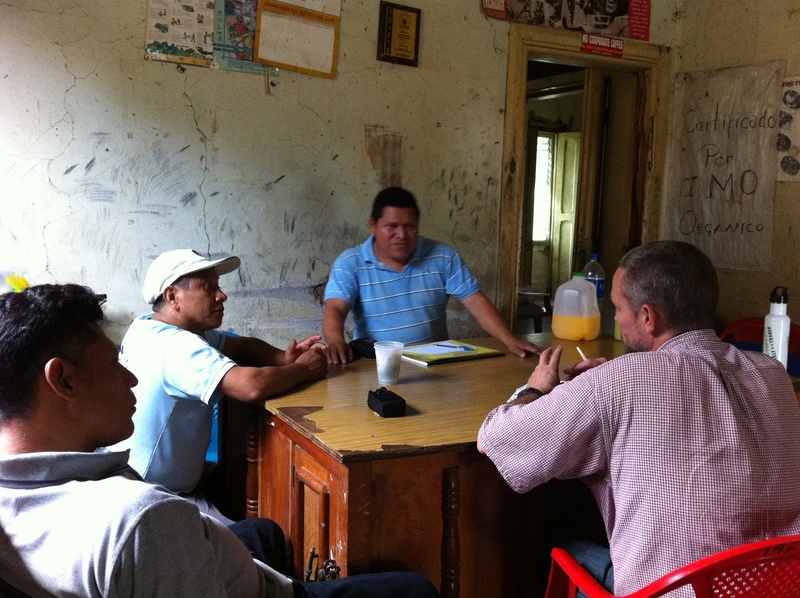 How would the coops learn to control quality and educate their members to grow and process quality coffee? There was a lot of economic risk taken and no meaningful profit to made from fair trade. Only mission driven traders and non profits and visionary coops would take on this type of task. Just a few weeks ago I accompanied Todd Caspersen, Director of Purchasing and Rob Everts, Co-Director of Equal Exchange to El Salvador to attend the First International Gathering of the Small Farmer Symbol. 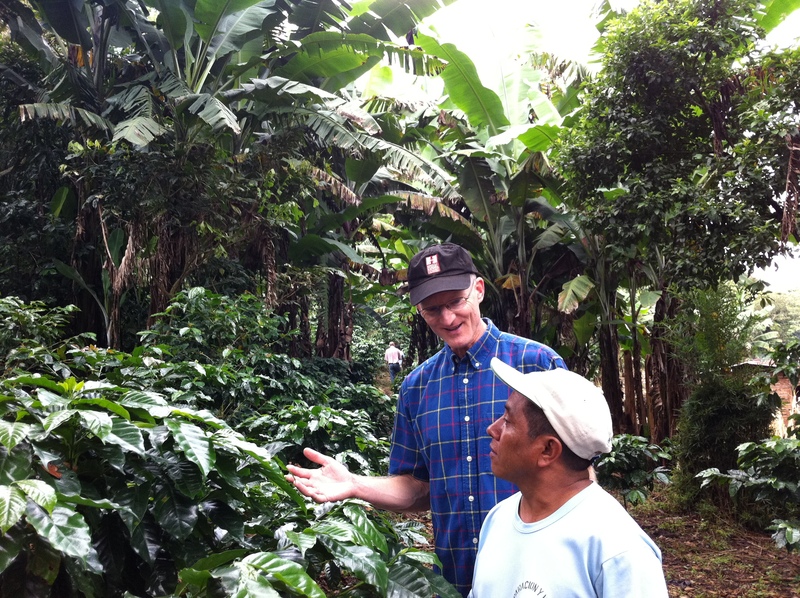 We took advantage of the time in El Salvador to visit with our small coffee farmer coop partners and see how they’re doing. On the 2 1/2 hour drive out to Tacuba, in the western department of Ahuachapan, I was reminded by our driver, one of the Las Colinas Board members, that this year marked the 15th anniversary of our trading relationship with the co-op. During those 15 years, much has changed. As far as I can tell, it is all for the better. The 89 members of Las Colinas own the 500-acre co-op collectively, a form of land ownership that is fairly uncommon these days. Like many other agricultural co-operatives in El Salvador, Las Colinas used to be a large coffee hacienda; many of the 89 members, their fathers and/or grandfathers used to work there as day laborers picking coffee. Most people have heard about what the conditions were like in those days working on coffee, sugar, cotton and other plantations. In fact, throughout Central America, it was in large part due to the oppressive work conditions on large plantations that ultimately led workers to band together with unionists, and representatives of progressive student, women’s, religious, and other organizations to spark the populist social justice revolutions of the ’70s and ’80s. In 1980, in a futile effort to stave off the impending civil war, the Salvadoran government passed an Agrarian Reform Law which turned over several hundred large plantations virtually overnight into worker owned and managed cooperatives. The trouble was that the workers were given the land (which they had to pay back), but no technical assistance, access to bank credits, or market information. In the 40-odd years since that time, most of the agrarian reform co-ops have gone bankrupt and have had to sell their land or been forced to give it back to the banks. Las Colinas remains one of the few of those co-ops still surviving. Seven years ago when I first visited them, things were not looking so good. True, they were organized and running the farm themselves and the four or so containers of coffee they were selling to Equal Exchange was delicious and high-quality. 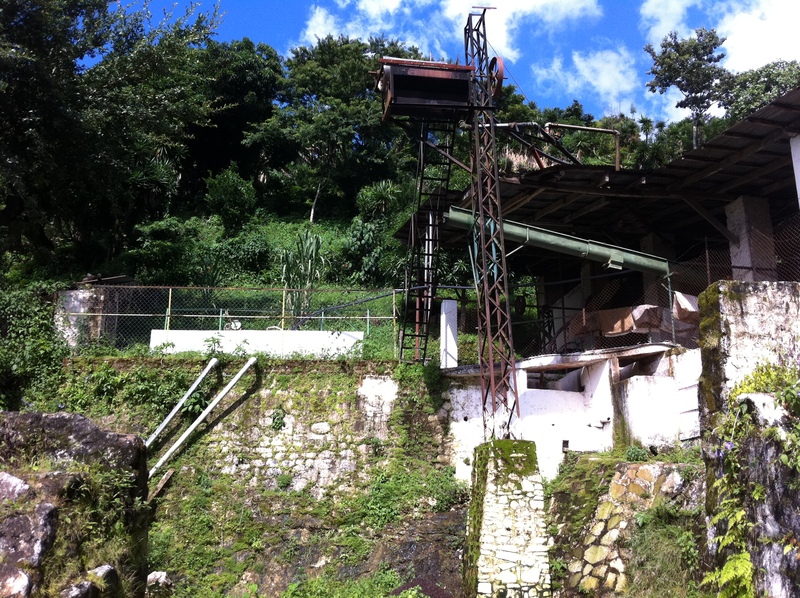 But their processing equipment was old, (I remember thinking that the machinery looked like something you’d see in a Dr. Seuss book), the coffee trees were old, and the soils depleted. Of most concern, the interest on the agrarian reform debt was exceedingly high and was mounting each year. Despite the fact that Equal Exchange was paying high prices for their coffee, the members of Las Colinas could not seem to get out from under their debt. 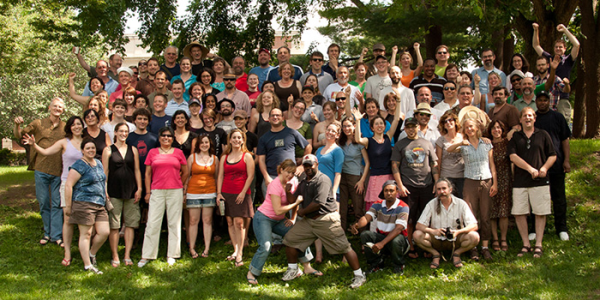 In the past seven years, a lot has happened to instill a sense of hope about the future of this co-operative. Having direct relationships with their buyer has certainly had tremendous impact. “The difference between an unjust buyer and a Fair Trade negotiator is that we now have a stronger chance to negotiate and arrive at a fair price. We sit with Todd and there is transparency, responsibility, and justice,” Pedro told us. One of the most important things we have been able to do is to rearrange our financing with them in such a way as to help the co-op pay back it’s bank debt in a more timely fashion. Through a grant from Catholic Relief Services, Las Colinas was able to purchase or renovate parts of their processing equipment. Today, they have a state of the art “ecological” mill which recycles wastewater used during processing back into the plant, helping both to conserve water and protect the soil and groundwater supply from contaminants. Instead of “dumping” the waste water into standing pools, they now use those pools, filled with recycled, clean water as fish farms. We saw six or seven which will soon be ready for harvest. The fish will help augment the families’ diets and will provide them with extra income. 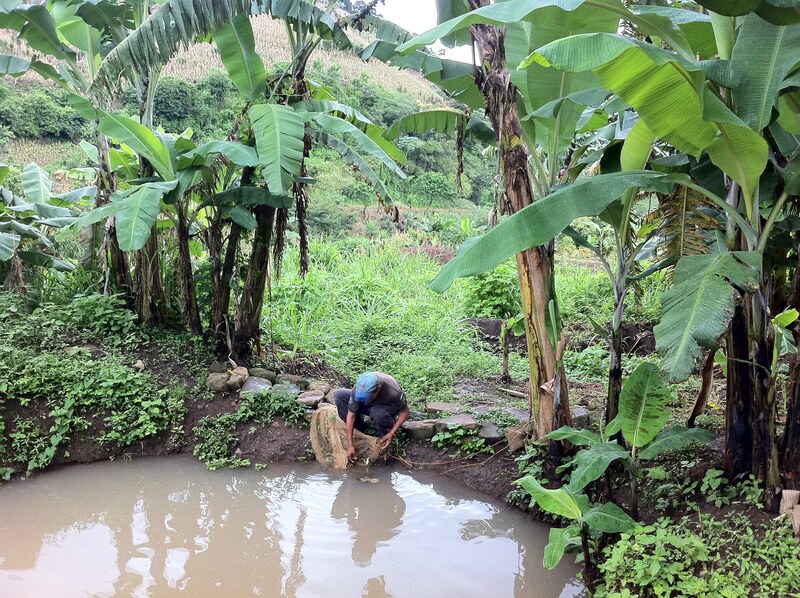 “Before we installed the new ecological mill, we were living with these smelly pools of water. It was pretty disagreeable and attracted many mosquitos. Now, our families will be eating lots of tilapia,” Pedro Ascensio told us as he showed us around. Las Colinas is situated on the border of one of El Salvador’s last remaining forests, the National Park, El Imposible. Their land also contains a natural spring that provides water to thousands of people in the entire municipality of Tacuba. For this reason, the farming practices of the co-op serves a very critical role in protecting and preserving the area’s important natural resources. Seven or eight years ago, they undertook the rigorous process of transitioning all of their coffee to organic production and today all of their coffee is certified organic. It is also grown under heavy forested canopy. 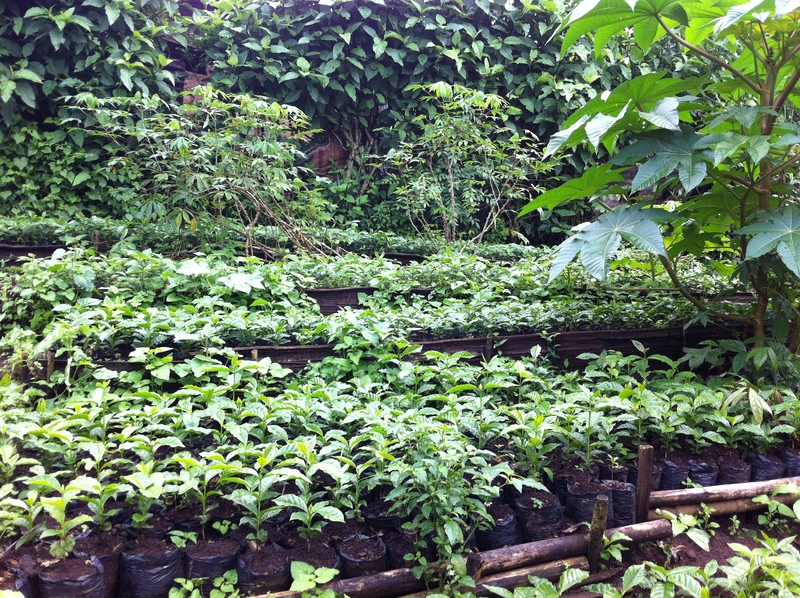 A new program involves the planting of 60,000 new coffee trees each year throughout the farm.If you take into account that the country of El Salvador is one of the most deforested countries in the western hemisphere, you can better appreciate the importance of Las Colinas in this respect.